The Book of Worlds: Apocalypse When? Trey over at the Sorcerer's Skull alerted me to the end of the world being scheduled for this last Saturday. As we've all now reached a safe distance to 21 May 2011, regardless of where we are in relation to the date-line, I think it is safe to say that yet again, Ragnarok has been delayed. Now, being a grown man in this day and age makes me more than a little sceptical towards such things. As a child in the 80's, the threat of nuclear holocaust was very much a part of my childhood. I grew up in a part of Norway where Soviet noise-transmitters occasionally blocked the radio-waves, and the Iron Curtain was a vivid part of my imagination. Then there was the Y2K. We, the human race, survived even that bad boy. 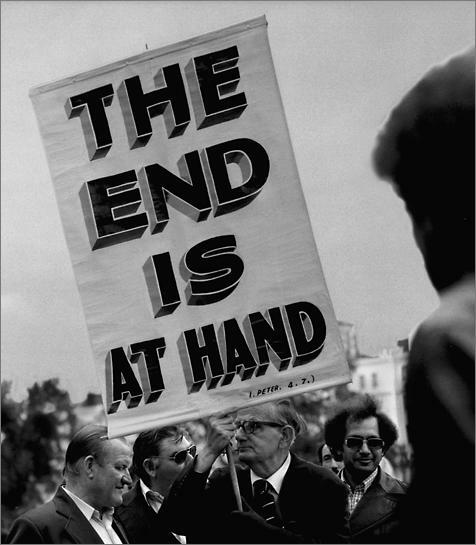 Fear not, there's always another end in sight, and the next widely publicised date is 21 December 2012. Given all these near-misses, there's no wonder the end of world is so popular in fiction. Our own culture sure has done it's best to keep the nightmare alive. God alone knows how many apocalyptic, and post-apocalyptic, role-playing games were published during the 80's and 90's; I've played a good handful of them, but those are only the tip of the proverbial iceberg. A novel, and most daring approach to this topic was executed by White Wolf, with pretty much every line they published up until 2004 promising total destruction. They even put it in the name of one of their lines: Werewolf: the Apocalypse. Vampire: the Masquerade, though more surreptitiously named, rode the pale horse of the Göterdämmerung relentlessly all the way in to the sun... er... rise. The end of the world didn't come in time, and in the end, that killed the game. Now there's irony for you. Note that the nWoD lines tread very carefully around anything smelling remotely like doomsday prophecies. Even my own setting has it's widely prophesied End of the World. Actually, there are a couple... I blame popular media. I wont delve into a lengthy harangue about why we have the hots for the Rapture, but I'll just note that we do, and we've always done. The ancients lived in constant fear of it, the year 1000 was believed to be the end by those who knew about such things at the time (I picture it having been a little like Y2K, only without the internet), as was 1666 AD (for obvious reasons, I would say). Our history is full of missed apocalypses, and I dare predict there'll be a few more before the end. "When a prophet speaketh in the name of the LORD, if the thing doth not follow, nor come to pass, that is the thing which the LORD hath not spoken, but the prophet hath spoken it presumptuously: thou shalt not be afraid of him. Till next time, unless the zombies get us first.